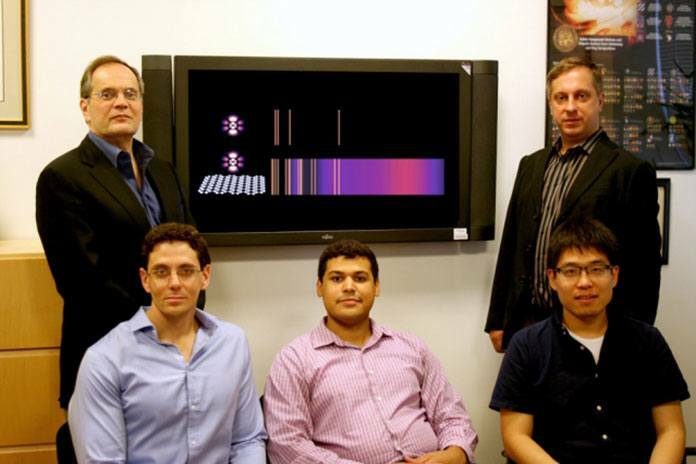 The new study held at MIT could reveal new technology areas based on light emission types. This study unveils new areas of light-matter interaction, which was previously thought impossible. Laws of quantum electrodynamics explains the interaction between light and matter, which is the base of various technologies. Generally, most light-matter communication processes are prohibited by electronic selection rules. This may limit the number of transitions between energy levels. For instance, the spectrogram is used to detect the material’s elemental composition, show few bright lines opposite to mostly dark background. These bright lines show the particular allowed energy level changes in the atoms of that element. In the dark regions, which generates most of the spectrum, emission at those energy levels is prohibited. Through this new study, scientists discovered that these constraints can be revoked by using limited waves near atomically thin, 2-D materials. They showed transitions, which normally take the universe age to happen could be made to happen within nanoseconds. Due to this, many dark regions of a spectrogram become bright after an atom is placed near a 2-D material. Different electrons for different atoms has different energy levels. Whenever they jump from one energy level to another they give off a photon of light. This process is known as spontaneous emission. But, the atom remains much smaller than the light emission wavelength. It is about 1/1,000 to 1/10,000 as big. Shrinking the light is the trick that matches the scale of the atom in effect. Graphene enables a whole range of interactions, especially changes in atomic states that relate to absorbing or emitting light. In graphene, light can communicate with the matter in the form of plasmons. These plasmons look like photons but have 100 times the shorter wavelength. and very rarely enclosed into graphene. Thus, it can make some interactions with matter that has many orders of magnitude. Emission spectra are a widely used method for identifying chemical compounds; the bright lines reveal the different frequencies of light that can be emitted by an atom. 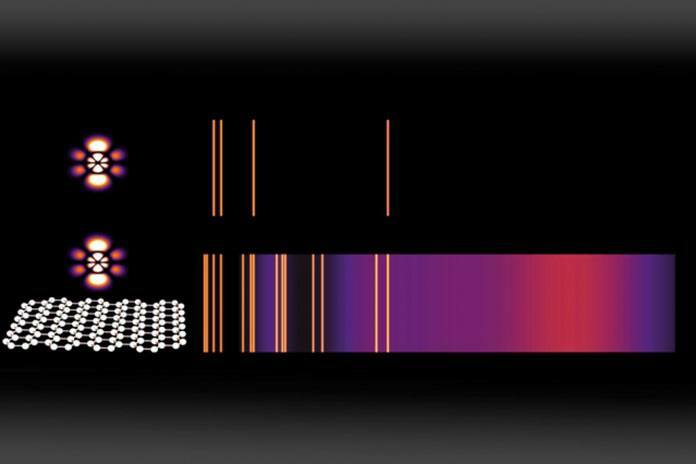 Here, a normal emission spectrum for an atom in a high-energy state (top) is compared to the emission from the same atom placed just a few nanometers (billionths of a meter) away from graphene that has been doped with charge carriers (bottom). For each energy-level transition, an orange line (or purple cloud) appears if that transition is estimated to be faster than one per microsecond — making it frequent enough to be observed. This method allows for concurrent emission of two involved photons. That means they distributes similar quantum state even after separation. This kind of generation of involved photons is essential elements in quantum devices. These prohibited transitions can be used to alter optical properties of materials. Altering these rules between light and matter can reconstruct optical properties of materials. Outside its scientific conclusion, this study has applications across multiple disciplines, periodic table for optical applications, spectroscopy and sensing devices, ultra-thin solar cells, new kinds of materials to absorb solar energy, organic LEDs with higher effectiveness, and photon sources for possible quantum computing devices. This work can produce a basis for a sub-field. It was difficult to imagine before few years and until now was largely unexplored.